I honestly have never understood people who keep fish as pets, for me they are no more than a “moving ornament”, but as this blog deals a lot with architecture and living design solutions I thought it most appropriate to show this condo concept I stumbled upon. 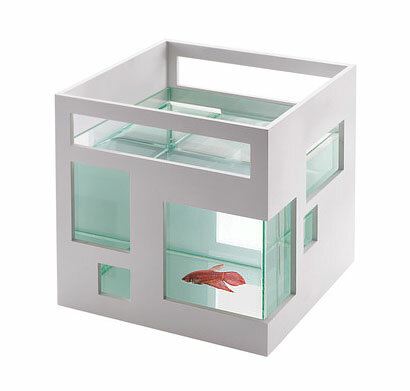 The fish condo is made of glass with a white ABS shell and can be stacked one on top of the other. This design won the Canadian Build a Better competition and was created by Teddy Luong, a student at Carlton University’s School of Industrial Design. Fish can be great pets and they’re quite smart. I like bettas. They light up when you come into the room and are very friendly & active in the right conditions. I do not, however, like this fish condo. I prefer to keep my fish in a more natural-looking environment. Anyhow, I truly enjoy your blog.